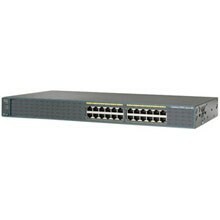 Cisco® Catalyst® 2960 Series Switches with LAN Lite software are fixed-configuration, standalone switches that provide desktop Fast Ethernet connectivity for entry-level wiring closet and small branch-office networks. These switches simplify the migration from nonintelligent hubs and unmanaged switches to a fully scalable managed network. The LAN Lite Cisco IOS® Software provides entry-level security, quality of service (QoS), and availability capabilities while lowering the network total cost of ownership.\n\nThe Cisco Catalyst 2960 LAN Lite Switches offer:\n-Dual-purpose uplinks for Gigabit Ethernet uplink flexibility, allowing use of either a copper or a fiber uplink; each dual-purpose uplink port has one 10/100/1000 Ethernet port and one Small Form-Factor Pluggable (SFP)-based Gigabit Ethernet port, with one port active at a time.\n-Scalable and secure network management.\n-Baseline Network Admission Control based on users, ports, and MAC addresses.\n-Easy network configuration, Cisco IOS Software updates, and troubleshooting using Cisco Network Assistant software.\n-QoS for traffic classification and shaping to prioritize various applications.\n-Single IP address, syslog, and Simple Network Management Protocol (SNMP) management for a stack of up to 16 switches.\n-Autoconfiguration using Smartports.\n-Enhanced troubleshooting for link connectivity problems and cable diagnostics.\n-QoS and support for multicast services.\n-Software updates at no additional cost.